Is Your Pool Leaking Water? On average, swimming pools lose about a quarter of an inch of water each day, yet variations in wind intensity, humidity and sunlight can drastically change water loss rates. 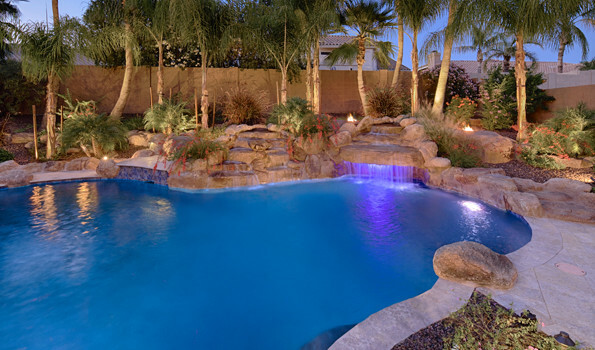 Leaks in your pool system may be difficult to find for one of two reasons. First, if you have an autofill device, it will continue to keep the pool’s water level the same by adding water on a more frequent intermittent basis. Second, if you fill the pool yourself with a hose, you may not notice that you are adding water on a more frequent basis. The average swimming pool will lose anywhere from 1/4″ to 1″ per week. If your water bill is higher than usual you may want to check to see if there is an on-going leak in the pool by trying the Bucket Test to determine whether the pool has a leak or is just experiencing routine water evaporation. 1. The bucket test is simple. Let’s get started by collecting a couple of items. You’ll want a bucket and a wax pen. Stop manually adding water to the pool or turn off the water to the pool’s autofill until the test is complete. 2. “What is an autofill?” It is a device that fills your pool with water automatically. As with skimmer baskets, autofills are typically located next to the pool inside a recessed container beneath a round lid. 3. If you have an autofill, let’s turn off its water supply. Find the pool’s backflow device which is usually located at the back or the side of the house. The pool’s water supply line is usually the first line out of the pool’s backflow. Turn its shut-off valve to the off position. 4. Also, no splashing water out of the pool during the bucket test or backwashing the pool. 5. Place a bucket or container on a pool step without submerging it, and then fill it with water so it is the same level with the pool water. Use a wax marker to mark the level of the water in the pool and the level of the water in the bucket. 6. Wait a minimum of two to three days to let natural evaporation occur. If it rains or it’s a windy day you may have to redo the test. If both the levels go down the same amount in the pool and in the bucket, then you do not have a leak. If the water level in the pool has dropped more than the level in the bucket, you have a leak. 7. If you have a leak, you can do a little more testing to indicate whether leak is in the pool structure or the plumbing system. Pool Cover – Consider using a pool cover to reduce evaporation and help keep your pool clean. When pool owners cover their pool with a swimming pool cover, they can reduce the amount of evaporation by up to 95%.